Men’s skincare can be tricky. Guys need something that’s going to work not only for their skin, but their schedules and wallets as well. As any busy guy will tell you, if it works: it’s worth it. Here’s where ultra-cool men’s skincare line Jack Black comes in. Their authentic and original products will work wonders for just about any guy with any skin care needs. Whether it’s an all-over wash for face, hair and body or a cleanser, scrub, or moisturizer you can slather on by the sink – Jack has got you covered. My boyfriend loved the Award Winning Pure Clean Daily Facial Cleanser (6 oz. ; $18.00), especially after stealing it from my bathroom. With skin-calming ingredients like Aloe and Sage Leaf, what’s not to love? It cleans deep down, removing dirt and oil without harsh ingredients that leave your face dry and irritated. And if you are dry, slap on some of their new Dry Erase Ultra-Calming Face Cream (2.5 oz. ; $38) or their famous Double-Duty Face Moisturizer with SPF 20 – both leave skin feeling soft and hydrated (non-greasy!) all day, through meetings, meals out and even your afternoon gym session. If Jack Black does one thing well, it’s providing the perfect all-in-one products for non-fussy guys who don’t have a lot of time on their hands for skin care. 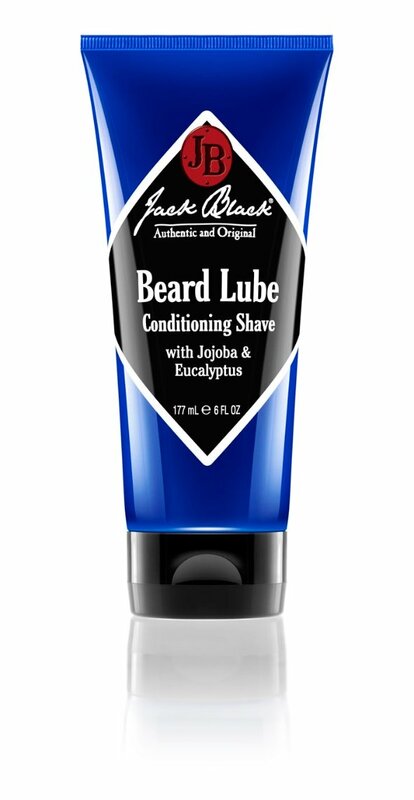 Take their Beard Lube (6 oz. ; $16.00) for instance – it’s a pre-shave oil, shame cream and facial skin treatment all in one. Not only does it soften the hairs and make them easier to shave, but it hydrates each pore to hold in moisture and make shaving easier and less painful. Similarly, their All-Over Wash for Face, Hair and Body (6 oz. ; $15.00), touted as “The Ultimate Guy Product” works great to clean everything, without stripping skin or hair of the moisture it needs. The brand has been recognized and awarded by publications like Men’s Health, Esquire, GQ and Details. Above all, I recommend their award-winning Intense Therapy Lip Balm (0.25 oz. ; $7.50) for its magical healing properties (magical, I tell you!). It smoothes and relieves dry lips, hydrating with skin conditioners and antioxidants and protects from further damage with SPF 25. This emollient balm does it all, while tasting amazing in flavors like Black Tea & Raspberry, Vanilla & Lavender, and my new favorite – Mango. Even their classic Mint flavor works to freshen breath.